View of a House and its Estate in Belsize, Middlesex, by Jan Siberechts 1696. I came upon this painting in Tate Britain and immediately recognised the scene. This is where I live. Or where I used to live before it became now. 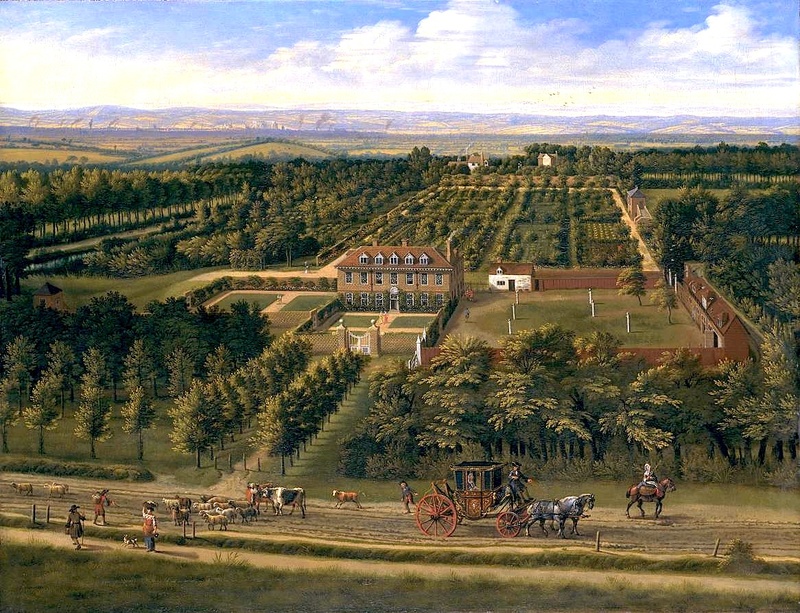 The estate was established sometime after the Norman invasion and bore the name Bel Assis, which is Old French for well situated; in time Bel Assis became Belsize which is now the name of a neighbourhood in London just south of Hampstead. The road running left to right in the foreground is called Haverstock Hill; leftwards it descends to London, rightwards it gradually climbs upwards to Hampstead and the Heath. The avenue of trees leading from Haverstock Hill to the house is now called Belsize Avenue and it is still lined with trees, different trees, but still with the sense that it is an avenue of approach to some grand place. A section of the high wall surrounding the immediate grounds of the house survives to the left of Belsize Avenue; you can see it by peeping into the gardens of numbers 14 and 16. And at the far end of the orchard to the right of the avenue grew a mulberry tree which stands on the corner of Belsize Avenue and Belsize Terrace to this day, or a direct descendant of it does, and drips its deep purple juice all over the pavement every summer. A footpath went along that way, running outside the near wall of the estate. This is what survives of the path called Cut-Throat Alley, infamous for the murder in 1845 of James Delarue by Thomas Hocker which Charles Dickens called 'One of the worst murders I ever heard of', much regretting that it was along 'one of my daily walks near Hampstead'. The great house had been the seat of the Earls of Chesterfield but had fallen into neglect not long before Daniel Defoe, the author of Robinson Crusoe, came upon it in the early 1720s and described it in his Tour Through the Whole Island of Great Britain. The house had recently been taken over by an enterprising fellow who turned it into 'a true house of pleasure', offering a variety of sport and games, so that it attracted 'a wonderful concourse of people', among them the Prince and Princess of Wales, who were 'gratified by all sorts of diversion', until 'the wicked part broke in' so that the magistrates intervened and it was 'suppressed by the hand of justice'. The Tyburn rises near here and flows down to the Thames, passing beneath Buckingham Palace and dividing to create an island on which Westminster Abbey was built. Nowadays, though, it travels entirely through underground culverts. Along its journey towards the Thames from Bel Assis it passed by the western end of Oxford Street where Marble Arch now stands and gave its name to Tyburn, the spot where from medieval times to the eighteenth century criminals were hanged and the bodies of traitors were exposed. As for me, when there is a torrential rain the Tyburn rises from beneath the streets like a memory. I live behind the great house where a light coloured strip on the right marks the boundary of the gardens to its rear. What looks like it might be a coach house more or less marks the spot. That is where I am, or where I used to be when this neighbourhood was Bel Assis. For some years I have thought myself suffering from a false memory. 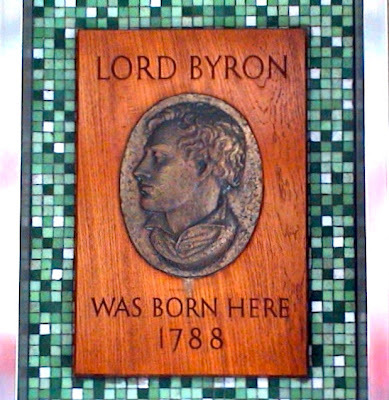 When walking in Cavendish Square near Oxford Circus I could have sworn I had once seen a plaque of some sort in the vicinity announcing the birthplace of Lord Byron. But look as I might, I never could find it and began to think the whole business was a fit of imagination. Then yesterday I was visiting the John Lewis department store in Oxford Street looking for a 2014 pocket diary and I rediscovered the mysterious memory, or rather its replacement. There was once a plaque, bronze on wood, attached to the doorway of John Lewis, the side entrance on Holles Street. This must have been what I had remembered, but at some point it had been removed, explaining why I failed to find it again. Then in 2012 it was replaced by a City of Westminster plaque, and this is what I came upon yesterday. Replacement plaque erected in 2012. This is the fourth plaque erected to commemorate the birth of Byron on this site. The first was put in place in 1867 and was in fact the very first such plaque - the beginning of the idea of marking the spot where famous people have lived, an idea that has spread throughout the United Kingdom and now to many parts of the world. 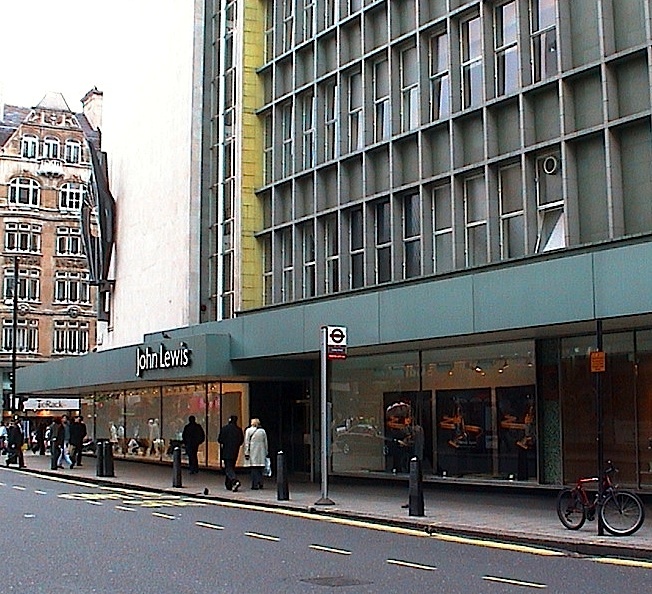 John Lewis Holles Street entrance. plaque was lost. 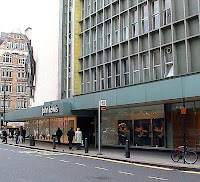 John Lewis had already opened a draper's shop in Oxford Street in 1864 and within a few years his flourishing business occupied the corner of Oxford Street and Holles Street, and here just before the Second World War his son John Spedan Lewis erected a second plaque which was thought lost when the building was bombed in 1940, though it has recently turned up. 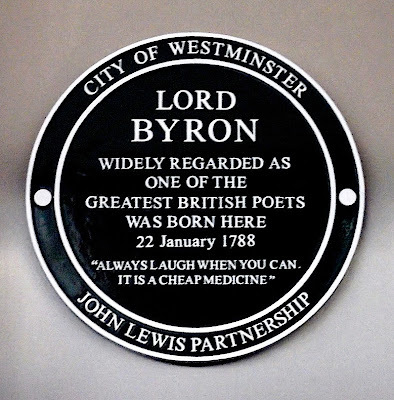 This was replaced by the third plaque, the wooden one with the bronze profile of Byron, which I had begun to think was a fantasy of mine, and that in turn has been replaced by the new City of Westminster plaque with Byron's advice to laugh when you can. So I was in John Lewis today and also in Waitrose, its basement food shop, and I was thinking of paradise. I was thinking of paradise because that is what some friends of mine call Waitrose and John Lewis, and I do not disagree. Waitrose is certainly my favourite supermarket and I always feel in good hands when I shop for clothes or computers or just about anything else at John Lewis. The reason, though I did not know this at first, is that the John Lewis Partnership, which includes John Lewis department stores and Waitrose supermarkets all over the country, and the Peter Jones department store in Sloane Square, is a company owned by its employees; in fact its employees are not employees at all, they are partners - shelf fillers, check out assistants, buyers, department managers, no matter what they may be, all are partners. This came about because the founder's son, John Spedan Lewis, decided that not only should customers be guaranteed the quality of the goods they were sold, but that his employees should be guaranteed quality in their work and the way to ensure that was to hand the business over to them, to have everyone share in its fortunes. That philosophy is explained in this brief biography of John Spedan Lewis and also in this BBC broadcast he made in 1957 when he was an old man. Spedan Lewis has rightly been voted Britain's greatest business leader in a BBC poll. Certainly the decency and the spirit of the man and his philosophy has been transmitted to the shop floor, and that explains why, even long before I knew all that, I thought along with my friends that pushing a trolley along the aisles of Waitrose was a transport through a kind of paradise. 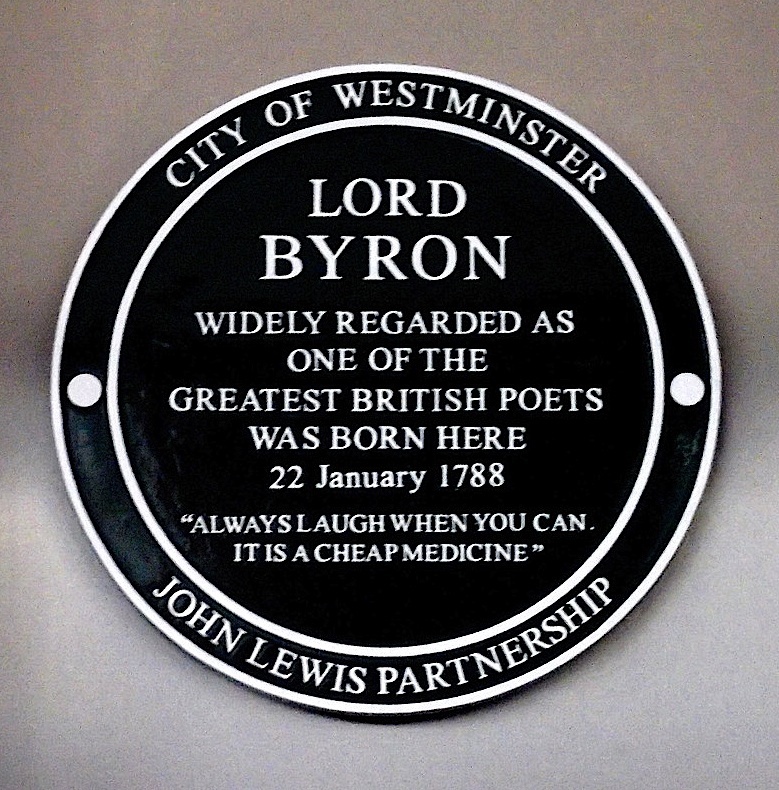 And so how happier the association now that I have found Byron's plaque on the side of my favourite department store. Poor George Gordon never had the pleasure of shopping for Waitrose own-brand baked beans but he did have other delights, and now I will connect with these too next time I approach the check out counter. 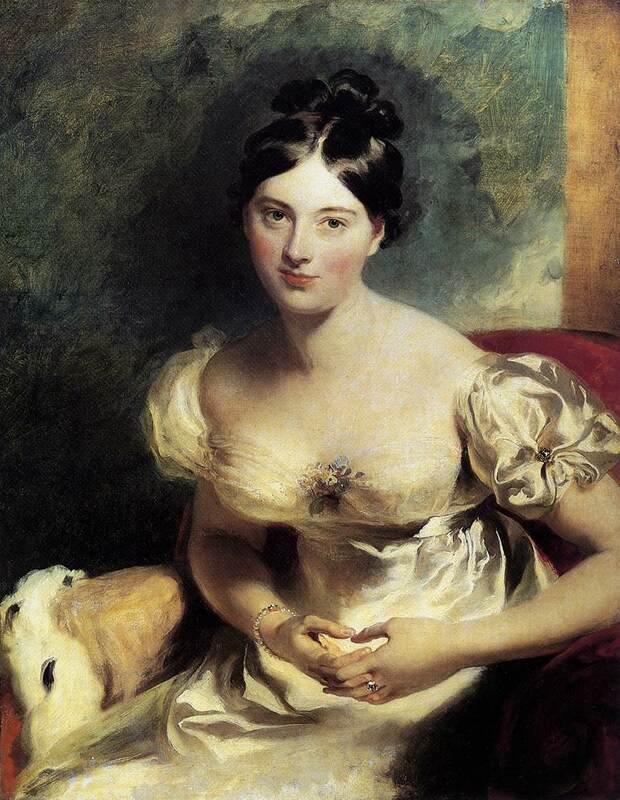 Byron's version of paradise, one of them anyway, was Marguerite, Countess of Blessington. When she visited him in Italy he showed her a neighbouring villa, hoping to entice her to stay; the place was called Il Paradiso and he wrote this little poem, called Impromptu, his tribute to the paradise he found in her proximity. What mortal would not play the Devil? 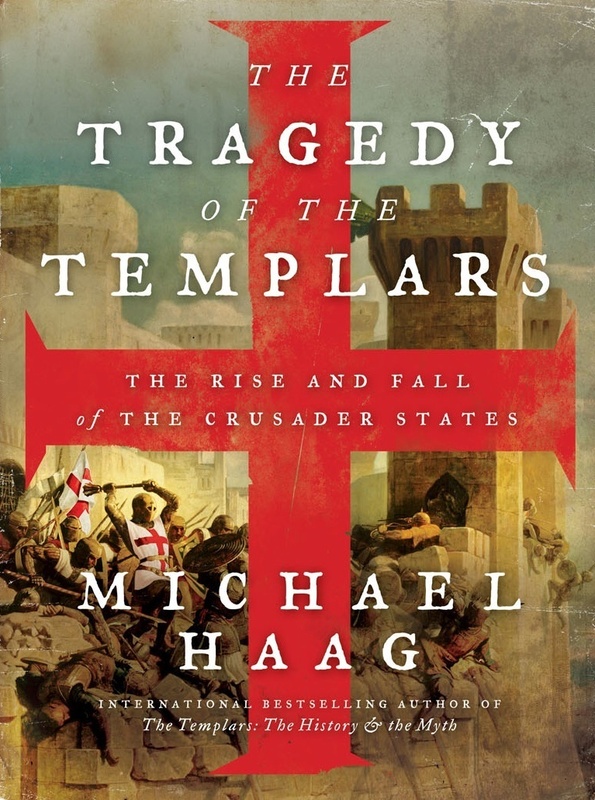 For anyone interested in medieval history, The Tragedy of the Templars by Michael Haag should be read alongside The Crusades by Thomas Asbridge, says Booklist, the influential American journal. Booklist, which is the magazine the New York Times calls 'an acquisitions bible for public and school librarians nationwide', is the review journal of the American Library Association. It recommends works of fiction, nonfiction, children's books, reference books, and media to its 30,000 institutional and personal subscribers. In-house editors and contributing reviewers from around the country review more than 7,500 books each year, most before publication. 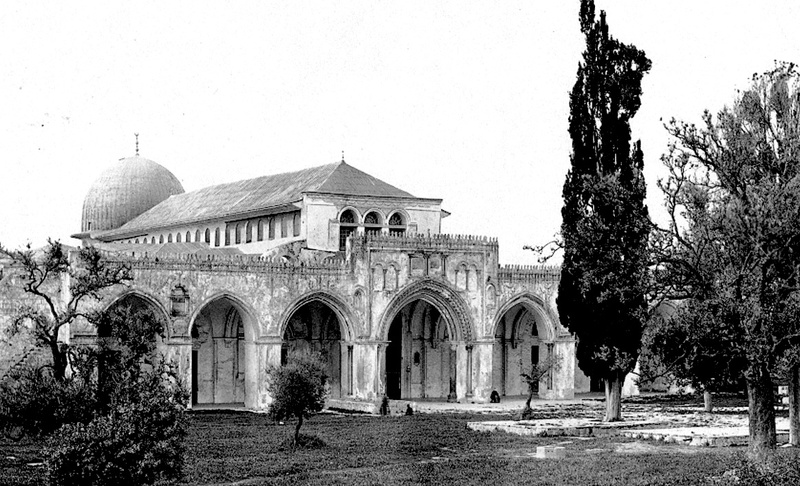 The Aqsa mosque on the Temple Mount was the headquarters of the Templars. The central three arches are Templar work. Their formal name shortened from the Poor Fellow-Soldiers of Christ and of the Temple of Solomon, the Templars were the elite military force of the Christian states established by the Crusades. 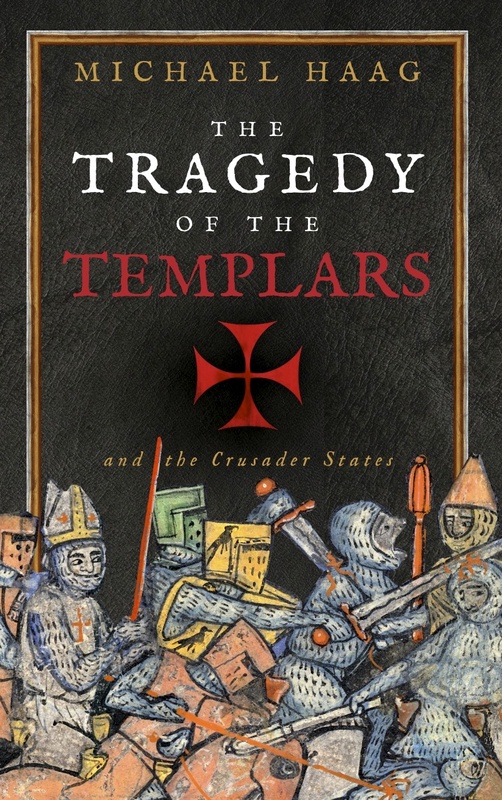 Haag’s history of the Templars prefaces the organization with the origins of the First Crusade, which in 1099 reclaimed Jerusalem for Christianity. Travel to the Holy Land nevertheless remained dangerous, and providing protection to pilgrims was one reason the pope sanctioned the Templars. The order’s ensuing growth into a religious army reigns as the theme of Haag’s account, which covers the Templars’ role in the wars between Christendom and Islam. But beyond spiritual fervor and organizational discipline, landholdings and banking operations underlay the corporate success of the order. Wealth also, Haag recounts, contributed to the Templars’ ultimate downfall. 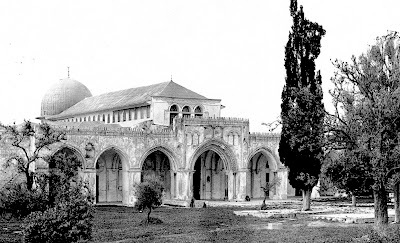 Having lost its military justification to exist with the final extinction of the Crusader states in 1291, the order’s assets were snatched by the king of France, leaving the pope to abolish the Templars in 1312. In league with The Crusades (2010), by Thomas Asbridge, Haag’s work will pique the interest of medievalists. The Booklist review can be seen online here.